PILON & CIE./ LAVASSEUR - Carte des établissements .. L'Inde..
PILON & CIE./ LAVASSEUR,V. - Carte des établissements .. L'Inde..
Carte des établissements .. L'Inde.. - PILON & CIE./ LAVASSEUR,V. Map maker : PILON & CIE./ LAVASSEUR,V.. Size : 11.4 x 11.5 inches. / 29.0 x 29.3 cm. Description :Detailed map of India. On verso 5 manuscript maps in pen and ink showing "Territoire de Pondichèry", "Territoire de Karikat, scale 1:300.000", "Yanaon et son territoire, scale 1:150.000", "territoire de Mahe", and "Chandernagor, scale 1:75.000". Each map very detailed, showing settlements, streets and railway. 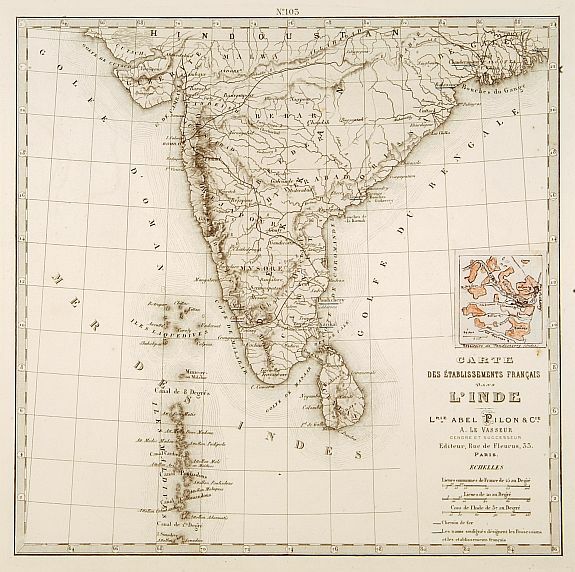 Also on recto smal inset with manuscript map of Pondicherry. Condition : Steel engraving with inset maps in manuscript. In good condition.